The famous Napoleonic Cuirassiers are still paraded as republican horse guards during official events and on the 14th of July parade. During World War One, they had their traditions shattered, when it became obvious that the cavalry was obsolete in the new kind of stalemate which prevailed on the western front. When the first tanks appeared in 1917, new tactics in conjunction with tanks proved there were still possible uses for cavalry in particular phases of an engagement. 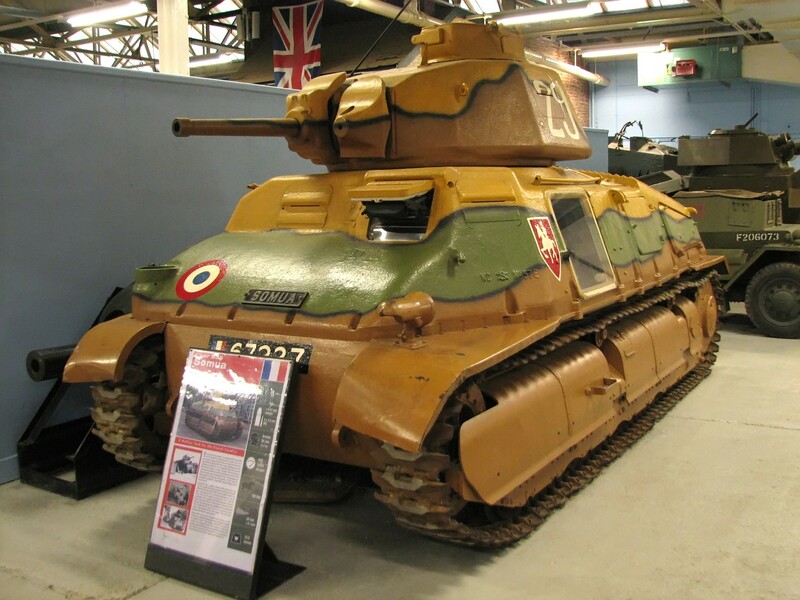 Since then, the French, as well as the British and Soviets, always made the distinction between three kinds of tanks, the infantry and cavalry ones, as well as the heavy breakthrough tank, “char de rupture”, like the FMC 2C. Plans for a new cavalry tank came as soon as 1931, revised on 26 June 1934. They requested a new, heavier model, capable of resisting any antitank gun of the time. The task was given to the St. Ouen Societe d’Outillage Mecanique et d’Usinage d’Artillerie (SOMUA). At that time, the old rule banning cavalry from using tanks was removed. 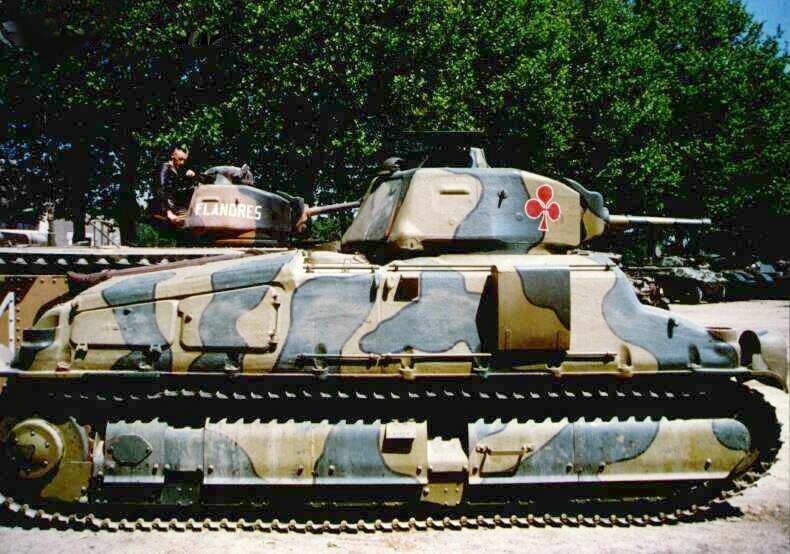 Cavalry tanks were until then called “Automitrailleuses” (armored cars) in French service, like the AMR 33/35. The SOMUA was in a completely different league in many aspects. It was the first cavalry vehicle properly called a tank. It was classed as a fast medium, not aimed only at reconnaissance, but also contact and engagement with advanced enemy units. The hull was cast in four parts -a world first- and the turret was cast as well. The hull and turret maximum thickness were around 47 and 40 mm (1.85/1.5 in) respectively. The turret was derived from that of the B1 heavy tank, but with an enlarged turret ring. The medium-barrel SA35 47 mm (1.85 in) was efficient against most German and Soviet tanks of the time, using a provision of 90 AP and 28 HE shots. There was also a coaxial 7.5 mm (0.295 in) Reibel machine gun with 2250 rounds. All S35 units were scheduled to be equipped with radio, but as ER28 production never reached the required level, only one tank in five was equipped, despite the fact that many of them included an antenna. Engineer Eugene Brillé worked on the suspension, inspired by the one used on the Škoda LT vz. 35, with eight road wheels on four bogies with leaf springs and another independent roadwheel and a large torsion wheel. The initial tracks were 75 mm (2.95 in) wide, with 144 links, later 103 with enlarged pieces. The rear engine was side by side with two self-feeding fuel tanks. The crew was protected by a thick firewall bulkhead. The V8 SOMUA engine, designed by engineer Javier-Sabin, developed about 200 bhp and used a double filling tank system which sometimes caused some problems with inexperienced crews. 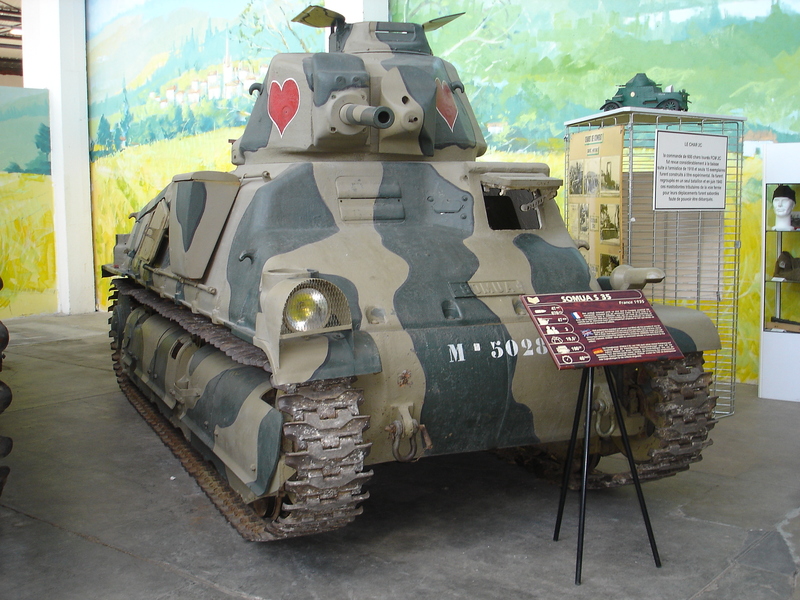 Overall, the S35 was regarded as the most potent medium tank of its day. It is said that the US Ordnance studied the S35 for construction aspects which later helped to design the Sherman. The preliminary design was ready in September, and the definitive plans in October, just as the construction began. The first prototype was ready in April 1935, undergoing successful trials until August. The model was named after its year of production. But the official denomination was AMC (Automitrailleuse de Combat). A preseries model AC4 was to be tested until January 1936 with the new APX1 turret, and then production was scheduled to start in March. 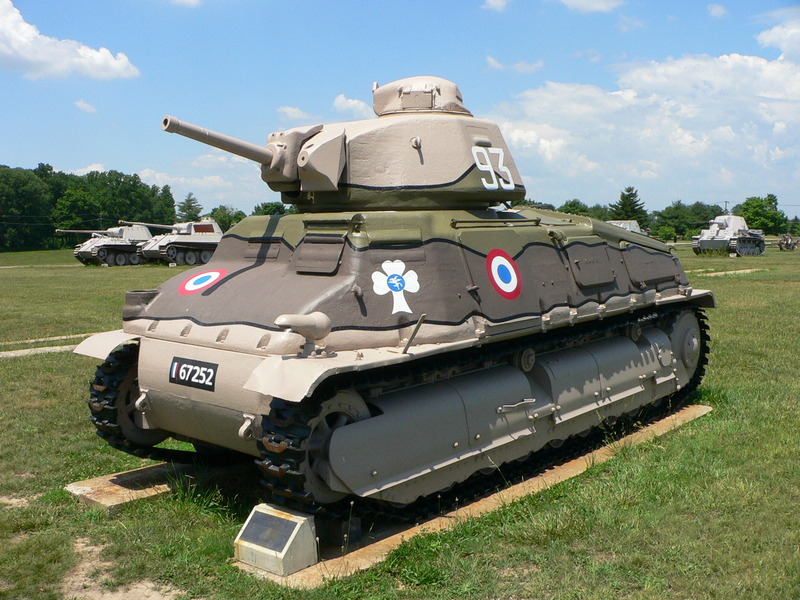 However, the S35 had several flaws, the first of which was a common issue among French tanks. The commander was still overloaded and the turret still lacked hatches, mostly due to budgetary reasons, which caused the same commander to sit completely outside of the turret in order to get a good view of the area. The other flaws were maintenance-related. The cast modules didn’t facilitate any access to the suspension, which was uneasy and time-consuming. The cost per unit was high and only limited numbers of this excellent medium tank were produced. By the 1st of September, 1939, 246 had been delivered, and only 288 were in service in May 1940, but 430 were built in all by June 1940. Production was halted for the more advanced SOMUA S40. Due to French needs, a Polish order was declined. In May 1940, the bulk of the S35 force was allocated to the 1st Amy deployed in Belgium, in the 1st, 2nd and 3rd DLM (Division Légère Mécanique). Because of the lack of support and a weak constitution compared to the German Panzerdivisions, these units performed as they could, with high losses, but with some successes, most of them being attributed to the S35’s armor and firepower. The battle of Hannut (May 12-14), the largest tank battle of 1940, occurred between six armored divisions, a clash of nearly 1700 tanks and armored vehicles. Despite tactical victories along strongpoints, it was a strategical failure, the Germans systematically outmaneuvering the French, gaining local superior firepower, with excellent communication and support. At the same time, French “by the book” tactics proved hopelessly obsolete. On another occasion, on May, 17, Colonel De Gaulle’s 4th DCR, comprising many S35s as well as Hotchkiss, B1 and Renault tanks, tried to stop the German advance at Laon and Montcornet. Although they gained momentum and local successes, even taking hundreds of German prisoners, the Luftwaffe and quickly deployed German Flak 88 mm (3.46 in) used as antitank batteries and crushed any further progresses. Many S35s of the remaining forces fought to prevent three German Panzerdivisions from approaching Dunkirk. They were destroyed or ultimately abandoned, deprived of ammunition and fuel. Later in June, other S35s fought in Weygand’s so-called “strongpoints”, which were outmaneuvered once again, hammered by artillery and the Luftwaffe, and eventually forced to surrender one by one. Perhaps a hundred remaining S35s escaped to Vichy France, and were allocated to the Vichy regime for police duties. Most were transferred to North Africa (12e régiment de Chasseurs d’Afrique). 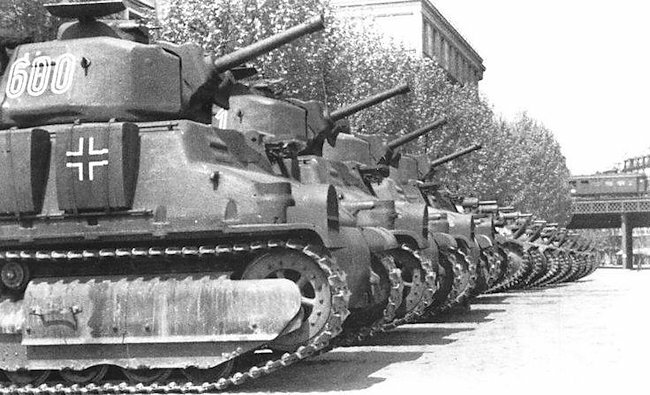 When the Allies landed in November 1942, the Free French Forces were allocated these S35 in average condition, fighting Axis forces in Tunisia. They were ultimately replaced by M4 Shermans. Most of the S35s remaining in France were captured by the Germans, some sources mentioning about 250 to 290. They were renamed Panzerkampfwagen 35-S 739(f), and usually a new German Panzer III or IV commander cupola was fitted to the existing turrets. In February 1941, most of these fought with the Panzerbrigade 100. Eventually, this unit was renamed 211 Panzerabteilung and sent to Finland, fighting on the Eastern Front. They were outclassed by Soviet KV-1s and T-34s. Others formed suppletive units for re-organized Panzerdivisions, for training and transport (turretless or with an open superstructure), and for police duties. Some fought the resistance on many occasions, and some were hastily sent to Normandy in June 1944 (Panzer Ersatz Abteilung 100 and Panzer Abteilung 206). Others were sent to Yugoslavia, fighting the partisans. Many dismounted turrets were also allocated to German armored trains, which served in all European theaters. Italy was also given 32 tanks. They fought in Italy itself, acting as a reserve. In December 1944, a single German unit was still equipped with an handful of S35s. But they were hopelessly outclassed. Second Cavalry Battalion, Gen. Billotte’s First Army, Battle of Hannut, 13-15 May 1940. A regular S35 during the 1937 maneuvers, with the 4th Cuirassiers, the first cavalry unit to receive SOMUAs. SOMUA of the 4th DCR (part of the 3rd Cuirassiers), during the Montcornet counterattack on 17 May 1940. It also fought at Crecy sur Seine and Laon. SOMUA of the 2nd DLM, which fought at Craonne, 14th May 1940. Panzerkampfwagen 35-S 739(f), 202nd Panzer Abteilung, Balkans, March 1944. They were made of steel, not “iron.” The 88 was used as an anti-tank weapon in Poland and reclassified as a dual-purpose weapon before the invasion of France. Every side illustration in your article shows nine (9) road wheels, not eight. The “gun operator” was the commander, although the radio operator might help with loading. Got rid of the iron. Illustrations were right, text was wrong. Yeah, that bit about the gun operator was plain wrong. Thank you for all your corrections. This article is really old and is now marked for rewriting.